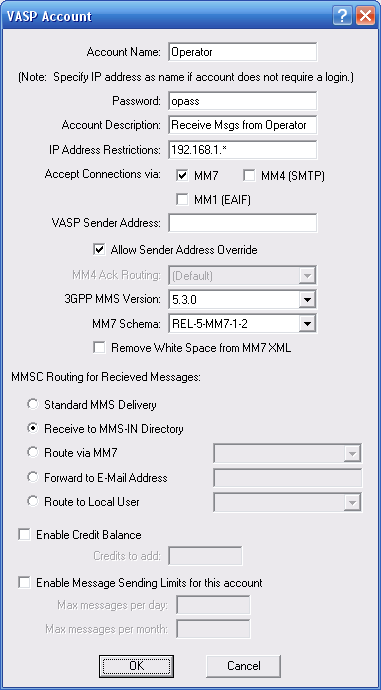 This section describes configuration information specific to receiving MMS messages from an operator MMSC using MM7, MM4 or EAIF. Receiving MMS messages over an MM1 connection using a GPRS modem is described in the section titled Connecting to an Operator MMSC – Using a GPRS Modem. In order to receive messages from an operator MMSC using MM7, MM4 or EAIF, the mobile operator must configure their MMSC to initiate outbound connections to your MMSC for message delivery. The process of configuring the Now SMS & MMS Gateway to send messages to an operator MMSC is separate from the process of configuring the gateway to receive messages from an operator MMSC. While an operator MMSC is technically not a VASP (Value Added Service Provider), in order to receive MMS messages from an operator MMSC, you must configure a VASP account for the mobile operator on the “MMSC VASP” configuration dialog. Please refer to the section titled Configuring MMS VASP Accounts for more information on these configuration settings. When an operator MMSC connects to your system to deliver received MMS messages, the process is the same as a VASP connecting to your system to submit messages for external delivery. The primary difference is that the “MMSC Routing for Received Messages” setting is different for a VASP compared to an operator MMSC connection. When defining a VASP account that is used to receive messages from a mobile operator, it is important that the “MMSC Routing for Received Messages” be set to any value other than “Standard MMS Delivery”. This is because the “Standard MMS Delivery” option would specify that the messages should be routed for external delivery. However, when receiving messages from an operator MMSC, you would want to perform receive processing against the messages.